Morán Morán is pleased to announce a group exhibition, titled Objects to Identify, which marks the gallery’s ten-year anniversary. With a text authored by Brontez Purnell, the exhibition features work by Diana Al-Hadid, Brian Belott, Charlie Billingham, Keltie Ferris, Eve Fowler, Michael Genovese, Luis Gispert, Bendix Harms, George Herms, Terence Koh, Eric N. Mack, Robert Mapplethorpe, Anders Ruhwald, Jacolby Satterwhite, David Benjamin Sherry, Agathe Snow, Willie Stewart, Torey Thornton, Kon Trubkovich, and Nick van Woert. Morán Morán is pleased to present, Form Shapes Language, an exhibition presenting works by seven artists – Angela de la Cruz, Ann Edholm, Torkwase Dyson, Michael Genovese, Tomashi Jackson, Anthony Pearson, and Hayal Pozanti – who communicate using spatial elements and geometric abstraction. Emphasizing the affinity between shape, form, and personal narratives, the works presented in this exhibition translate intent through the non-representational and the non-objective. Whether by traditional means, alternative materials, exploring the link between social politics and color theory, or by drawing parallels between abstraction and information technology, these artists carry geometric abstraction’s legacy, using it as a foundation for personal expression. Moran Bondaroff is pleased to announce Michael Genovese’s third solo show with the gallery, titled Intervals. This exhibition presents a new body of work comprised of large-scale paintings of urethane on gessoed canvas, which visually derive from screen grabs of keyword image searches, specifically, the grid that briefly appeared while images were loading on his mobile phone. Proportionally scaled to the screen ratio, these paintings replicate the exact color and pattern that occurred during each image query interim. For over ten years, social practice and archives have remained an active interest for the artist, as he has worked through various methods and diverse pursuits toward accumulating material. “Lines and Cracks and Zebras and Horses – a recently completed body of work based on lineation, cleave, and the concept implied by the aphorism: “When you hear hoof beats behind you, don’t expect to see a zebra.” A series of plasma-cut steel wall reliefs located throughout the gallery compose a subtle arrangement based equally on materiality and concept. Paris, London, Hong Kong presents Joliet, a solo exhibition of new work by Los Angeles-based artist Michael Genovese. 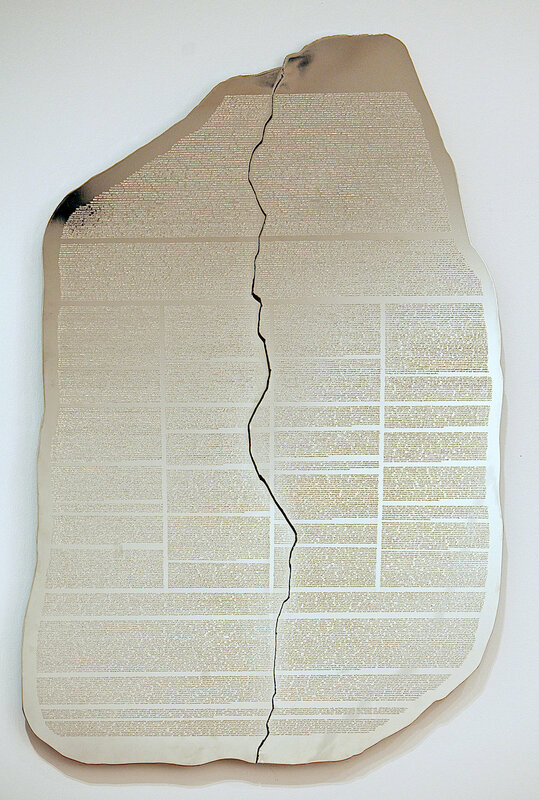 "Joliet features a series of plasma-cut steel wall reliefs that explore the value of space, isolation, and stillness. The exhibition’s title references the Illinois city of Joliet, originally spelled Juliet, which is considered by many a small prison town. The connotations of the name (Shakespeare’s Juliet and the city’s reputation), raise a sense of longing and contemplation, and the tension of restraint. 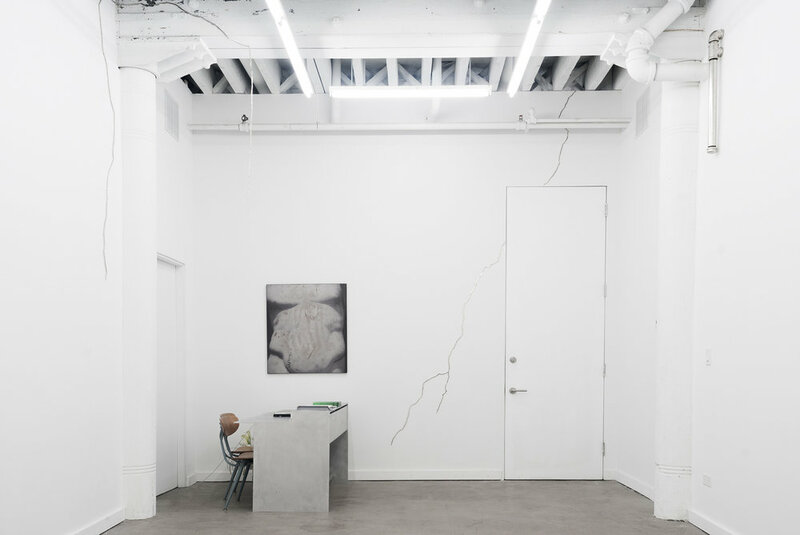 Genovese’s works resemble large cracks along the gallery walls, causing a consideration of the confined space and the perimeters, therein. The weighted steel works are the culmination of historical fractures, political, and popular culture references, which Genovese traces and removes from their original context and repurposes for his practice. He employs a reduced material vocabulary as a means to quiet the mind and heal information overload. In doing so, he leaves the viewer in a contemplative confinement; left to confront their innermost thoughts, fears, and desires." Immokalee mattress patterns, Toner on bond paper. Michael Genovese presents Post-Post Scriptum, the second exhibition in a series of work created during his one-year visiting artist tenure at the Frost Art Museum and Florida International University. This body of work is an interpretation of the archived information, research, and development accumulated over the past year, when Genovese studied the social commentary and drawings collected on campus and the surrounding area, through his P.S. Project (2008-12). The information gathered was designated into 16 various subjects, including: Faith, Stereotypes, and Existentialism, to capture the zeitgeist of students during a time of change. The text was then transcribed and translated into different languages, archived in an on-line repository, which was created in collaboration with the Frost Art Museum. Fueled by a desire to understand what it is to be human, at the most elemental of levels, contemporary artist Michael Genovese set out to examine the American public during times of transition. This four-year exchange created a social dialogue, through the most fundamental form of communication – conversation. With Post Script, Genovese presented the first of two exhibitions. Seven large-scale works pointed to his research and development, gleaned during his one-year visiting artist tenure at the Frost Art Museum and Florida International University. He combined over 20 different surfaces, carved and written on with specific themes, such as: existentialism, dreams, and Intoxication, including works from different parts of the country to create a conversation about cross-cultural comparisons. This monochromatic exhibition featured an aluminum composite material incised with markings created by students of FIU and the general public. The plates were arranged in various compositions that pointed to works he studied from the Frost Art Museums permanent collection, including pieces by David Hockney, Agnes Martin, Louise Nevelson, and Frederick Kiesler. The exhibition begins with a combination of rectangles and squares that climb the wall and rest on the floor, paired with an extrusion chair made by Emmet Moore. This composition is a silhouette of Frederick Kieslers Galaxy 1, and features six aluminum composite plates that have incised drawings and social commentary from various institutions from around the country. The locations include: FIU campus, The Miami Art Museum, The Museum of Contemporary Art Chicago, The University of Texas San Antonio, Loyola University, and a plate installed in a bathroom at a local billiard hall. It's Not the Heat, It's the Humility. Michael Genovese’s work operates as a reflection, both in a conceptual context and in a literal sense. This exhibition addresses a range of subjects, from Art History to American culture, pomposity to personal debt. The artist holds up a mirror in order to understand his identity and his role in relation to these subjects, while challenging the viewer to perform the same exercise. How we define ourselves, our choice of expression, the ways we are influenced by what we read and experience, all create cause for reflection and require a measure of humility in doing so. Genovese’s text engravings on high-polished aluminum panels are simultaneously illegible and painstakingly detailed; they are further evolved reincarnations of pulp and prose. By turning his formerly disregarded mail – unpaid bills, debt collector threats, and legal documents – into sacred objects, he aims to more accurately convey the power of burden. Also among this collection of engravings is a panel cataloging public commentary gathered from a previous project, citing nonsensical quotes like “Tippy-toe on the pooty-side” alongside profound examples: “Our dreams don’t fit on your ballot”. Another engraving plucks sections of cultural essays; from Ralph Ellison’s “Invisible Man” : “You ache with the need to convince yourself that you do exist in the real world…”. Two chrome-plated, twin pieces, present the myth of Narcissus – one in Spanish, the other in French. A pentaptych of paintings, executed in a style similar to the engravings, rewrites selections from a manifesto on Futurism – a lofty art movement, full of Italian bravado, which fell short of its own expectations. “Today, let tomorrow go” is the incomprehensible message on a monochromatic black painting. In each incarnation of the two-dimensional work a reflection is forced, but an obstacle exists – the process of analysis is difficult, uncomfortable, and at times simply impossible. The overall presentation of this work is an appropriation of theories from “Art and the Power of Placement” and a nod to the bygone era of formal gallery settings. Three large-scale sculptures continue the conversation of obstacle and experience. A porch, missing its home, is preserved like a giant chunk of amber containing the DNA of a tragic history. A bizarre arrangement of ordinary pipes and chains is elevated to grandiose through its nickel-plated treatment. Metal rails are manipulated into a circular formation, grounded with cement footings molded from traffic cones. The motive of this work is also an interactive one; an invitation to flex your agility on a course constructed to humiliate. Accumulated sheets of paper, in actuality, weigh less than an ounce, yet can resonate the poundage of an anvil. Genovese takes intellectual ideas and gives them anatomy to match significance, while trying to preserve their original integrity. Ten-gauge aluminum panels somehow feel ephemeral, and a hulking wooden sculpture still gives a fragile impression; interpretations change depending on the view. Installation view, MCA 1-5, Carved aluminum, baked enamel finish. Layers of neon pink and green paper painted with bold letters are plastered over the gallery wall like flyers that accumulate on urban buildings or discount signs at grocery stores. These attention-grabbing colors, created from unmixed sign paint, draw the viewer to concise yet open-ended, multilingual thoughts about society. Zora Neale Hurston's observation, "All my skin folk ain't all my kin folk,"and the artist's own mantra, "We all we got," are written in Korean, Urdu, German, French, Spanish, Polish, and Bosnian on these humble posters. In the engravings displayed nearby, the two quotes reappear alongside further social commentary and unknown names tangled within baroque patterning. Where the signs are bright, outgoing, spontaneous, and fragile, the intricate engravings on tar-colored sign substrate are dark, inward, laborious, and relatively permanent. While the signs evoke grassroots advertising, the engravings evoke dangerous and secret forms of expression, such as scratchings on trains and buses, in bathroom stalls, or on desks at the back of a classroom. Executed during his residency at the Museum of Contemporary Art, Chicago, these text-based works draw on familiar modes of communication encountered at stores or on the street in order to capture contemporary voices. To better record language that is alive, Genovese created this set of signs and engravings in collaboration with visitors and staff at the MCA. Avoiding static dictionary definitions, he enlisted native speakers at the museum to translate the phrases he ultimately painted on neon posters. Likewise, the intricate engravings produced during this residency were built up from messages carved by museum goers. Because of his insistence on a human element in his work, Genovese's interaction with everyday life as art has a sincerity that is lacking in the innovative contributions of Marcel Duchamp and Pop Art to this terrain. While Duchamp appropriated ordinary objects, Genovese, informed by his prior career as a specialty sign painter and sign contractor, creates his pieces with his own hands. While Pop artists tended to aestheticize the vernacular, Genovese's work is grounded more in a collaborative process than in an aesthetic. Genovese effectively resurrects Josef Beuys' conception of "social sculpture" whereby social interaction is a work of art and every person is an artist ”without the utopian promise Beuys championed. Though his works often involve painting, then, it is clear that Genovese's medium is not strictly paint, nor is it simply industrial sign materials; he also works with the abstract media of language and human interaction.